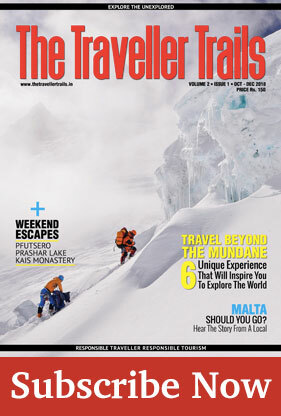 Thought of a trek where you are surrounded by some of the world’s highest mountains? A trek where your romance with the mountains never ends. A trek where you find yourself in the most awe-inspiring beauty of the nature. The Goecha La trek has a spectacular wilderness with world’s third highest peak towering above virtually undisturbed forest – Mt. Khangchendzonga (Kanchenjunga). The state of Sikkim has always been an unmatched experience than what you gain from trekking in any other part of India. 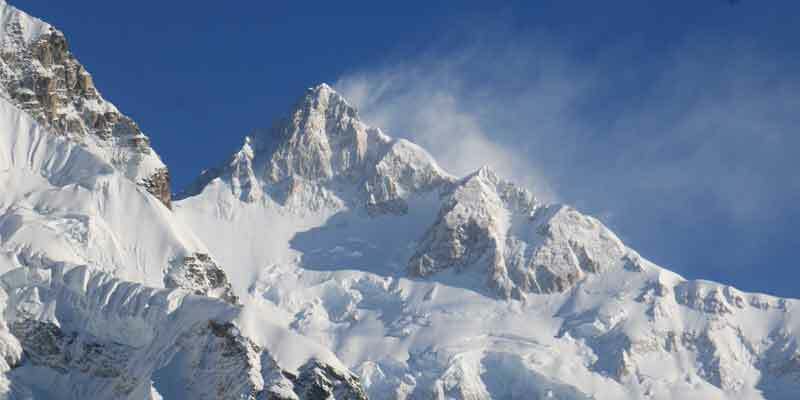 The Indian Himalayan trek in the state is considered to be the closest to the big mountain treks in Nepal. 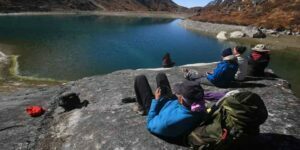 Located in the Eastern part of the Indian Himalayan ranges in Sikkim, Goecha La Trek is a treat to all the global trekkers. The trek to Goecha La begins at Yuksom, a small town with a number of famous monasteries (The most famous one is Dubdi Monastery, established in 1701, and also the first Monastery in Sikkim) and small eateries catering the trekkers. 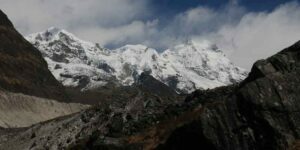 Being at the head of Khangchendzonga National Park, it serves as the entry point to Goecha La for the Trekkers and Mountaineers. The town is the last of civilisation and is connected by a motorable road, taking 4-5 hours from Gangtok. 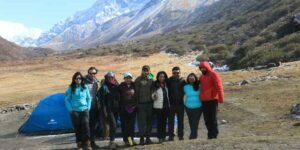 Such was our last trip to Goecha la, accompanied by 12 fellow trekkers, we took off. We were packed up and thrilled for the trek and as we started, the path cheered us. We headed for Sachen, our first camping site for the journey. The trail to the first camping site at Sachen starts from the base camp. Walking alongside the Prek Chu river valley, the trek was easy with gradual climbs. The path takes you through a hanging suspension bridge over the Prek Chu River to enter Khangchendzonga National Park (One needs a permit to enter the National Park. You can either get it at Yuksom or ask your operator to arrange it). We had all the necessary documents arranged for the fellow trekkers, so we kept walking amidst the stunning wilderness. Nestled amidst lavish, intriguing and vibrant flora and fauna, Goecha La Trek paves way through stunning Khangchendzonga National Park. The opulent beauty of the trek is awe-inspiring as it opens the doors to murky valleys, snow clad mountains, enticing lakes and beautiful rivers. The Park is a UNESCO World Heritage Site under mixed criteria i.e Nature and Culture which is first of its kind in India. You are advised not to carry plastics in the Park or littering the park. The trek to Sachen takes around 4-5 hours and is the first resting point for the trekkers. A small log hut can be sighted just before reaching Sachen which shelters around 6-8 people along with a cooking area. For any larger group, you need to find a clearing where you can pitch your tent. The weather proved to be a bit moody as it started raining and snowing after 4 in the evening. It continued for hours and then abruptly stopped. While we set about star gazing, our cooks prepared dinner for us. It was sumptuous dinner considering the trek. At an altitude of 7200 feet, evenings in Sachen usually experience showering blessed by the low hanging clouds. The night is ideal for star gazing. We preferred trekking to Tshoka (9700 ft) from Sachen (7200 ft) via Bhakim (8600 ft). The trail takes a mesmeric turn with the first sight of rhododendrons! Enroute, we cross another suspension bridge hovering over the Prek River. We take a break at a tea shop in Bhakim which serves as a perfect resting point along with a captivating view. We gorge on our packed lunch and sip hot tea while gawking at the beauty. Bhakim also has a Forest Rest House, where many trekkers prefer to stay due to the view and convenience. The trek soon twirls into a exquisite trail with the rhododendrons still flourishing around. At 9000 ft, we started feeling the chill in the air biting our skin. Another half an hour trek later, Tshoka came into view with a Trekkers Hut and a Camping ground opposite it. The Trekkers Hut is a small beautiful building with only 4 rooms (first-come-first-serve basis). A little further in Tshoka itself, you can explore the cafes where trekkers can try the local beer – Tumba. Slightly uphill, there is a monastery situated perched with a handful of Tibetan families. 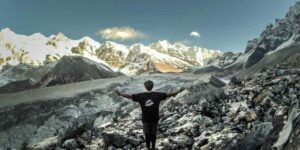 This was the first instance where we got to see the breath-taking view of snow-capped mountains of the Khangchendzonga range – Mt Pandim (6,691 mt) standing tall and aloof. 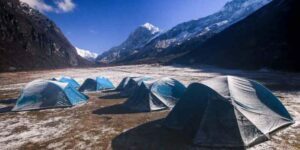 We pitched our tents in the open space adjoining the Trekkers Hut. We were raring to explore the place but the weather had other plans. It started raining again in the form of snow. To beat the time, we sat together unwinding long campfire tales. After a small uphill walk, we visited the pond near the monastery and which led us to to our next camping site. The forest of amazing rhododendrons, changed to a trail with wooden logs and benches on the sides. It looked like you are walking in a park (it actually is a national park). We broke ranks at Phedang for lunch and relaxed for a while. The views start getting better the further we moved. It was a ridge climb for most of the time. On our way, we crossed a shrine with the flags fluttering in the wind. After trekking a bit, we finally saw a hut with a stream running next to it. That’s it, we reached Dzongri. The next morning, we started for Dzongri Top (13,778 ft) at 4 in the morning. Trekkers don’t want to miss the beautiful sunrise kissing the Kanchenjunga range. You get a clear view of the snow-capped range standing at the top. Dzongri is a welcome sight for trekkers after the hard climb from Tshoka. Dzongri is a large cauldron, mostly meadows, with a panorama view of the mighty peaks of the Kanchenjunga range. For most trekkers Dzongri is a reward in itself. Many finish their trek at Dzongri and head back to Yuksom. The trek for the day was a moderate one with a descent to Kockchurang. Hiking ahead, we reached Kockchurang. The Trekkers Hut had Prek Chu River running by the side. The place is a dream frame, a hut standing still beside a white water river is a memorable view. After resting for a while, we started for Thansing. We crossed a bridge over the Prek Chu River and started climbing up. The trail was surrounded by rhododendrons mostly which flowers during the May-June season. It is fascinating to watch their pristine beauty during this season. The trail soon transitions into a rocky and barren landscape. The climb led to a big meadow – Thansing. There was a dilapidated Trekkers Hut which is deserted. It can be used as a kitchen though. Pitching your tents is the only option. The most amazing thing in Thansing was Mt Pandim rising right in front of us. The trek was easy with gradual climbing, which suddenly became steep towards the end while reaching Lamuney. It was a short trek of nearly 2 hours. We went ahead towards Samiti Lake (one of the most alluring lake I have ever seen). It takes about 45 minutes; you can rest there for a while, soaking in the beauty of the lake. The turquoise blue water has a fascinating affect and one doesn’t feel like heading back. We camped in Lamuney. It is not about the fitness you need, it is about the desire you have, the willingness you are ready to give your best. It is about achieving Mt. 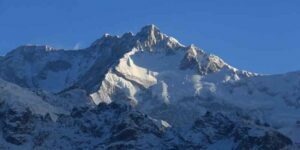 Kanchenjunga Keep in mind the safety of the fellow trekkers and the ecosystem that falls on our trek. We encourage fellow trekkers to not use plastics on our trek. This is the longest day of the entire trek. We woke up at 3 in the morning to ensure that we reach View Point 1 before sunrise. Everyone was excited to see the first rays of the sun lighting up Mt. Kanchenjunga. We saw the marvel unwrap before our eyes. We were surrounded by the big mountains and the most special was Mt Kanchenjunga (8,586 mts) right under our nose. We achieved what we came for, us and Mt. 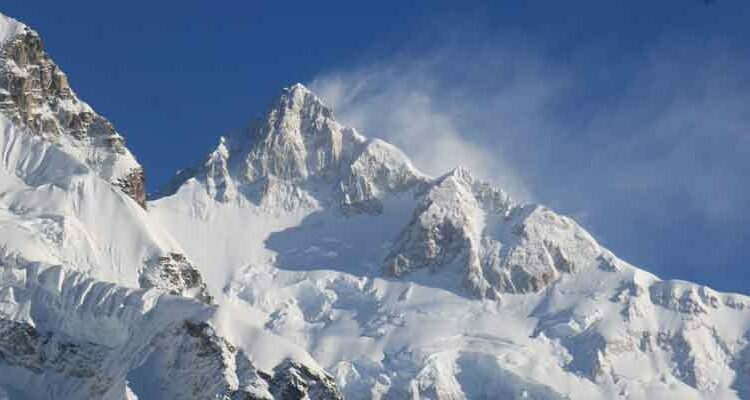 Kanchenjunga standing face to face, a dream come true for many! Mt Pandim (6,601 mts), Mt Narsing (5,825 mts), the Twins Peak (7,350 mts), Nepal Peak (7,150 mts), Mt Simvo (6,811 mts) and others are some of the mountains Goecha La trek unravels to its trekkers. We started our way back after a breath taking experience on the top of Goecha La with the mighty Mt. Kanchenjunga so close to us. We spent some quality and enriching time in the precinct of the Samiti Lake. The experience Goecha La gave us was a fantastic one, so close to nature and mountains. Goecha La is unexpectedly the best trek in the whole of India – is what every trekker embarking on this trek would feel! They say – the mountains are where I have been wounded and I have been healed! For years, men have come to the laps of these mountains. Why do they come here in the first place? What draw them into these parts of the Indian Himalayas? What is the magic that these mountains possess? These question can never be answered until you experience it firsthand! The trek to Goecha La begins at Yuksom. It serves as the entry point to Goecha La for the Trekkers and Mountaineers. The town is connected by a motorable road, taking 4-5 hours (124 Kms) from Gangtok. Trek permit for all trekkers – Obtained at the forest check post at Yuksom. Foreigners must obtain the ILP (Inner Line Permit) from Gangtok. Foreigners have to register for the trek in a group of 2 and above.